Turkey meat, commonly referred to as just turkey, is the meat from turkeys, typically domesticated turkeys. It is a popular poultry dish, especially in North America, where it is traditionally consumed as part of culturally significant events such as Thanksgiving and Christmas, as well as in standard cuisine. Turkeys are sold sliced and ground, as well as "whole" in a manner similar to chicken with the head, feet, and feathers removed. Frozen whole turkeys remain popular. Sliced turkey is frequently used as a sandwich meat or served as cold cuts; in some cases where recipes call for chicken, it can be used as a substitute. Ground turkey is sold, and frequently marketed as a healthy alternative to ground beef. Without careful preparation, cooked turkey is usually considered to end up less moist than other poultry meats such as chicken or duck. Wild turkeys, while technically the same species as domesticated turkeys, have a very different taste from farm-raised turkeys. Almost all of the meat is "dark" (including the breast) with a more intense flavor. The flavor can also vary seasonally with changes in available forage, often leaving wild turkey meat with a gamier flavor in late summer, due to the greater number of insects in its diet over the preceding months. Wild turkey that has fed predominantly on grass and grain has a milder flavor. Older heritage breeds also differ in flavor. A large amount of turkey meat is processed. It can be smoked, and as such, is sometimes sold as turkey ham or turkey bacon, which is considered to be far healthier than pork bacon. Twisted helices of deep-fried turkey meat, sold as "turkey twizzlers", came to prominence in the UK in 2004 when chef Jamie Oliver campaigned to have them and similar foods removed from school dinners. Unlike chicken eggs, turkey eggs are not commonly sold as food due to the high demand for whole turkeys and lower output of eggs as compared with other fowl (not only chickens, but even ducks or quail). The value of a single turkey egg is estimated to be about $3.50 on the open market, substantially more than an entire carton of one dozen chicken eggs. Turkeys are traditionally eaten as the main course of Thanksgiving dinner in the United States and Canada, and at Christmas feasts in much of the rest of the world (often as stuffed turkey). Turkey was eaten as such as early as the 16th century in England. Before the 20th century, pork ribs were the most common food for the North American holidays, as the animals were usually slaughtered in November. 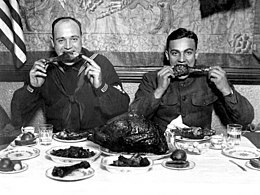 Turkeys were once so abundant in the wild that they were eaten throughout the year, the food considered commonplace, whereas pork ribs were rarely available outside of the Thanksgiving-New Year season. While the tradition of turkey at Christmas spread throughout Britain in the 17th century, among the working classes, it became common to serve goose, which remained the predominant roast until the Victorian era. In the UK in 2009, 7,734,000 turkeys were consumed on Christmas Day. Turkey with mole sauce is regarded as Mexico's "national dish". Turkeys are usually baked or roasted in an oven for several hours, often while the cook prepares the remainder of the meal. Sometimes, a turkey is brined before roasting to enhance flavor and moisture content. This is done because the dark meat requires a higher temperature to denature all of the myoglobin pigment than the white meat (very low in myoglobin), so that fully cooking the dark meat tends to dry out the breast. Brining makes it possible to fully cook the dark meat without drying the breast meat. Turkeys are sometimes decorated with turkey frills, paper frills or "booties" that are placed on the end of drumsticks or bones of other cutlets. In some areas, particularly the American South, they may also be deep fried in hot oil (often peanut oil) for 30 to 45 minutes by using a turkey fryer. Deep frying turkey has become something of a fad, with hazardous consequences for those unprepared to safely handle the large quantities of hot oil required. Turkey contains more protein per ounce than other meats. The white meat of turkey is generally considered healthier than dark meat because of its lower saturated fat content, but the nutritional differences are small. Turkey is reputed to cause sleepiness, but holiday dinners are commonly large meals served with carbohydrates, fats, and alcohol in a relaxed atmosphere, all of which are bigger contributors to post-meal sleepiness than the tryptophan in turkey. After World War II, cheap imported turkey tail became popular in Samoa. Because the cut is so fatty, it has been attributed to the rise in obesity rates in the Pacific. To combat obesity, turkey tails were banned from 2007 to 2013, only allowed back in Samoa to appease the demands of the World Trade Organization. For Thanksgiving in the United States, turkey is typically served stuffed or with dressing (on the side), with cranberry sauce and gravy. Common complementary dishes include mashed potatoes, corn on the cob, green beans, squash, and sweet potatoes. Pie is the usual dessert, especially those made from pumpkins, apples, or pecans. When eaten at Christmas in the United Kingdom, turkey is traditionally served with winter vegetables, including roast potatoes, Brussels sprouts, and parsnips. Cranberry sauce is the traditional condiment in the northern rural areas of the United Kingdom where wild cranberries grow. In the south and in urban areas, where cranberries until recently were difficult to obtain, bread sauce was used in its place, but the availability of commercial cranberry sauce has seen a rise in its popularity in these areas, too. Sometimes, sausage meat, cocktail sausages, or liver wrapped in bacon is also served (known as bacon rolls or "pigs in blankets"). Especially during holiday seasons, stuffing or dressing is traditionally served with turkey. The many varieties include oatmeal, chestnut, sage and onion (flavored bread), cornbread, and sausage are the most traditional. Stuffing is used to stuff the turkey (as the name implies) or may be cooked separately and served as a side dish (dressing). Wikimedia Commons has media related to Turkey meat. ^ "Turkey, fryer-roasters, breast, meat only, raw". USDA Nutrient Database. ^ "Why do turkeys have dark and white meat?". loc.gov. Library of Congress. Retrieved June 6, 2015. ^ Cecil Adams. "Why can't you buy turkey eggs in stores?". The Straight Dope. Retrieved November 25, 2010. ^ Kasey-Dee Gardner (November 18, 2008). "Why? Tell Me Why! : Turkey Eggs". DiscoveryNews. Retrieved November 25, 2010. ^ Parris, John (1982). Mountain Cooking. Asheville Citizen-Times. ASIN B000UIRZVE. ^ Karen Hursh Graber (January 1, 2003). "Demystifying Mole, México's National Dish". exConnect. Retrieved August 20, 2010. ^ "FAQs". Eatturkey.com. Archived from the original on 30 September 2011. Retrieved 18 October 2011. ^ "Does Turkey Really Make You Sleepy After Eating?". ^ "Product Safety Tips: Turkey Fryers". Underwriters Laboratories. Retrieved 2007-12-21. ^ a b Royston, Angela (2009). Proteins for a Healthy Body. Capstone Classroom. p. 43. ^ "Does eating turkey make you sleepy?". About.com. Retrieved May 11, 2005. ^ "Researcher talks turkey on Thanksgiving dinner droop". Massachusetts Institute of Technology News Office. Retrieved November 21, 2006. ^ "Samoans Await The Return Of The Tasty Turkey Tail". NPR.org. 9 May 2013. Retrieved 27 September 2014.